After studied the financial statements of the group, next will be the segment reporting. 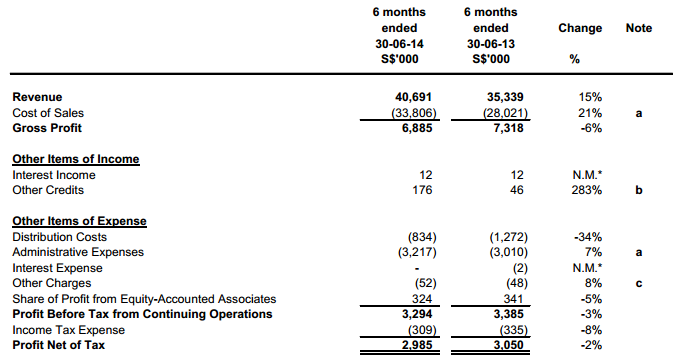 The group successfully converted into manufacturing based from trading oriented during the early days as seen from their revenue contribution. Currently, manufacturing division contributed the most to the group in terms of revenue and operating profit. While the gross profit margin of the group is stabilized at around 20% throughout the years, but operating profit margin for the manufacturing division showed a downward trend. For trading division, raw materials such as base oils, additives and chemicals used for the group's manufacturing plant constitute the bulk of the group trading segment. Franchising segment consists of international licensing and franchising scheme for the group's two lubricant products brand names, "SinO" and "AP Oil". Bulk of revenue comprised sales of raw materials to the group franchisees for producing lubricants under the brand names. Drop in revenue in FY2013 was due to slowdown business activities in Bangladesh due to political instability. It was followed by Vietnam and Bangladesh. Sales to Vietnam was done through the joint venture with AP Saigon Petro while sales to Bangladesh was mainly through franchising. AP Oil group basically managed by a group of family. Ms Lau is one of the founders of the group and she is the spouse of Dr Ho who is the chairman and managing director currently. 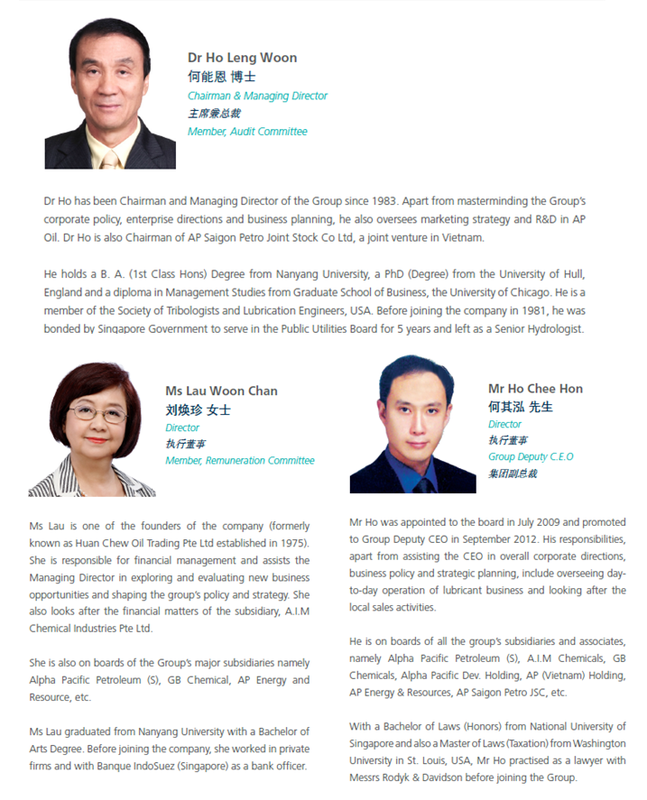 And their son currently also the group deputy CEO. Their total shares holding of the group is around 50%. The top 20 shareholders are holding around 72% based on AR2013. For the 6 months result end June 2014, the group recorded higher revenue but slightly lower net profit. The drop in gross margin was due to higher portion of trading activities. One thing to note is the cash dropped a bit while trade receivables increased a lot. Another thing to note is that the group adopts US dollars as functional currency while the financial presentation here is in Singapore dollars. 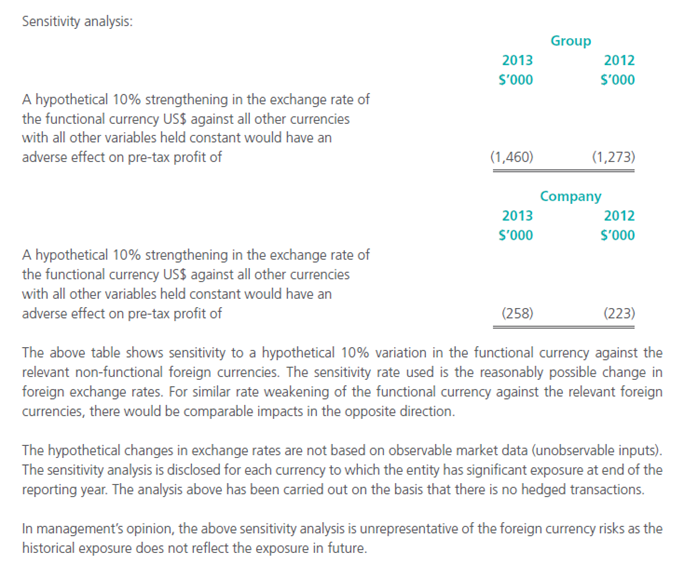 A 10% strengthening of USD against SGD will have some impact on the group performance. So to me, overall I can say that AP Oil is a fundamental good and stable company. You would not expect a tremendous growth of its business based on its historical record. In terms of valuation, the most attractive point of AP Oil of course is the cash on hands. Based on AR2013, the group had SGD26mils cash on hands which equivalent to 16cents cash per share while the current share price is SGD0.21.